We’ve turned the traditional umbrella upside down and inside out! Finally, there is a solution to those umbrella issues! 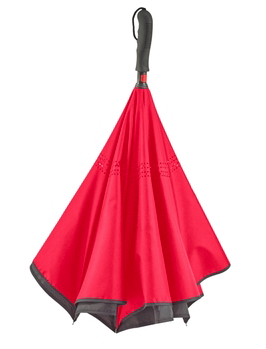 The Inverted/Reversible Umbrella is an absolute improvement on the standard umbrella because this umbrella opens upward. Your business will stand out from all the other companies giving away boring versions of this awesome umbrella. Sell the smarts of your company! You can sell the innovation of your company by gifting this unique design works perfect for confined spaces such as when you are entering or exiting your car. When getting out of your car, slide the umbrella through a small gap in the door opening and push the button to open. You won’t get drenched! When entering your vehicle, the umbrella collapses upward, so you’ll stay sheltered until the car door is almost shut. The 46” arc is wide enough to keep you and someone else dry. In addition, while closing the umbrella, the inverted design faces the wet side of the umbrella inward, exposing only the dry side. This creates a waterproof cone, keeping you, the floor, your bags and your car dry. The water stays inside the folded umbrella and you simply have to flip it and drain the remaining water instead of letting it drip. And, if your customer need more conveniences, the embedded push-button switch is easy to operate and will not pinch when you open the umbrella. You simply pull to close. Plus, the straight rubber grip handle is grooved to fit your hand for easy carrying. There is one last great feature you can tell your customers about. The unique inverted design allows this umbrella to stand on its own when closed. Keeping your umbrella handy makes it much more practical as there is no laying, leaning or leaving your umbrella somewhere inconvenient! This umbrella is made of two layers of durable, high-density water-repellent polyester fabric that is wind resistant so you don’t have to worry about the rain or the wind! The uniquely constructed skeleton rib is made of durable fiberglass for longevity and to enhances the windproof effect. This is an umbrella that’s been created for rain, wind and sunshine, protecting from ultra-violet rays. 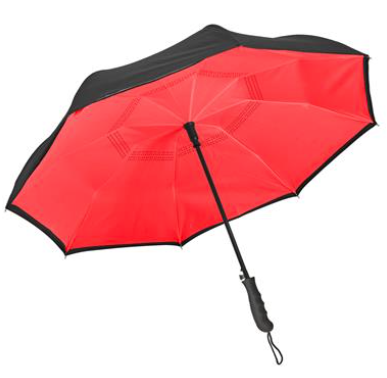 This exclusive umbrella is available in Black, Red, and Royal, great colors serving as a backdrop for our logo, which has a huge 9”x5” display area. Ask your Brand Consultant if you want something special such as additional imprint locations. Stay dry! Every umbrella purchased comes with a free smartphone Rain Alertz app. Not only is this giveaway branded with your logo, every time there is chance of rain, Rain Alertz sends your company’s customized message to the recipient stating there is rain in the forecast. RainAlertz, a mobile app that has been featured on the Today Show and the Home Shopping network, comes standard with this promotional umbrella. A hang tag on each umbrella has directions and an access code for the Rain Alertz app. When the chance of rain is greater than 40%, the app sends a message such as, “Bring your (business name here) umbrella.” Rain Alertz also provides a branded five-day forecast that is branded with your logo…a constant reminder of you every time the weather ranges from drizzle to downpour. Savings of up to 17%, only at ePromos. Get them while supplies last. A Brand Consultant will provide you with all the details.